Firstly, a PVC fence will last much longer. A wood fence has an average lifespan of roughly 10 to 15 years, while a PVC fence can last more than 50 years. This is because they are made from a type of durable plastic called poly vinyl chloride, which is as strong as wood but can stand up to the elements much better than a natural material. They cannot get termite damage, they cannot grow mildew, they cannot rot, and they cannot fade or splinter. They are even resistant to graffiti. Secondly, its sturdy nature also means that PVC fencing is virtually maintenance free. There will never be a need to paint or sand it. Nor do you have to worry about it blowing down in a storm or collapsing under the weight of someone attempting to climb it; PVC is five times stronger and four times more flexible than wood. Plus, it is easy to install yourself. Lastly, PVC fences look much cleaner and sharper than a typical wooden fence. They come in a crisp white color that is specially treated to withstand harsh UV rays. They are available in a variety of styles from traditional to contemporary, making them a perfect choice for any type of building. In fact, they have become so popular that they can actually increase the property value of your home. They are seen as an upgrade, similar to having granite counter tops in your kitchen. 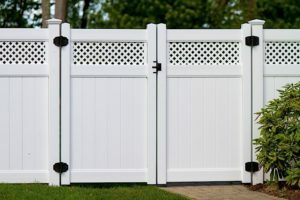 It is a common misconception that PVC fencing is much pricier than wood fences. The initial cost is often comparable, and when you factor in the savings from maintenance and repair, the value is obvious. Given the many advantages of PVC fences over wooden ones, it is a smart choice for any consumer.